President Donald Trump said on Wednesday that it was “about time” the NFL required players to stand for the national anthem. “It is an important moment in our game. We want to honor our flag and our country, and our fans expect that of us,” Goodell said. He said that the NFL has worked on a plan that it will present to team owners next week that will give players a platform to express their discontent on social issues. NFL viewership ratings tumbled to a season low on Monday following weeks of escalating protests by NFL players on the field. The form of protest was started last year by then-San Francisco 49ers quarterback Colin Kaepernick when he refused to stand for the national anthem. A CNN poll conducted by SSRS in late September found that 49 percent of Americans believed the players were doing the wrong thing, while 43 percent said they were doing the right thing. Many NFL fans have reacted with outrage to the issue, booing at players in stadiums across the country, and some posting videos to social media showing them burning their NFL gear. Vice President Mike Pence left an NFL game on Sunday after several players from the San Francisco 49ers knelt during the national anthem. 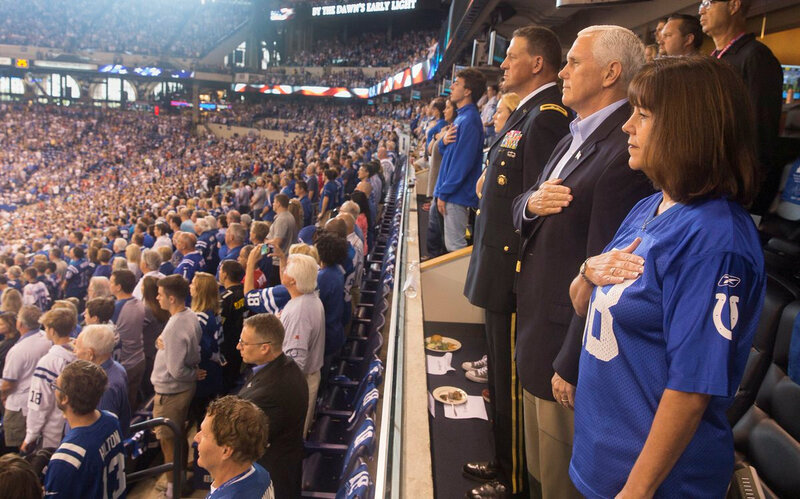 “I left today’s Colts game because @POTUS and I will not dignify any event that disrespects our soldiers, our Flag, or our National Anthem,” Pence posted to his Twitter account. Trump himself has tweeted about the issue multiple times since first bringing it up at the Alabama rally. “Why is the NFL getting massive tax breaks while at the same time disrespecting our Anthem, Flag and Country? Change tax law!,” Trump wrote on Twitter on Oct. 10. Dallas Cowboys owner Jerry Jones became the first NFL team owner on Sunday to tell his team to stand for the flag or sit on the bench. Jones said that any player who does not stand during the national anthem and disrespects the flag won’t be allowed to play. 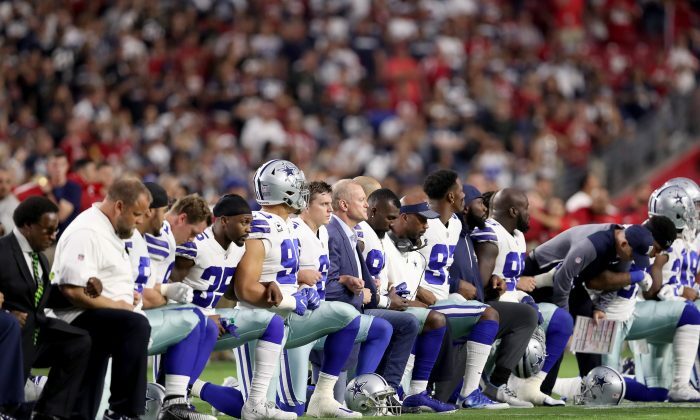 “If there is anything that is disrespectful to the flag, then we will not play,” Jones said, The Dallas Morning News reported. “We’re going to respect the flag, and I’m going to create the perception of it. And we have,” he said. Jones’s actions have since received praise from the president.